George, the second son of Edward VII and Alexandra of Denmark, was born at Marlborough House on 3rd June, 1865. Most of his childhood was spent at Sandringham, Buckingham Palace and Balmoral. George was now heir to the throne and it was decided that he could no longer risk his life as a naval commander. He was granted the title, the Duke of York and became a member of the House of Lords. 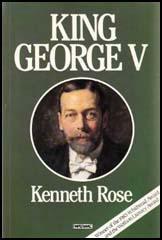 George was also given a political education that included an in-depth study of the British Constitution. However, unlike his father, he did not learn to speak any foreign languages. The outbreak of the First World War created problems for the royal family because of its German background and the family name of Saxe-Coburg-Gotha. To stress his support for the British, the king made several visits to the Western Front. On one visit to France in 1915 he fell off his horse and broke his pelvis. In 1916 Noel Pemberton Billing founded a journal called The Imperialist that was part-funded by Lord Beaverbrook. Billing claimed in his journal that there was a secret society called the Unseen Hand. As Ernest Sackville Turner, the author of Dear Old Blighty (1980) has pointed out: "One of the great delusions of the war was that there existed an Unseen (or Hidden, or Invisible) Hand, a pro-German influence which perennially strove to paralyse the nation's will and to set its most heroic efforts at naught... As defeat seemed to loom, as French military morale broke and Russia made her separate peace, more and more were ready to believe that the Unseen Hand stood for a confederacy of evil men, taking their orders from Berlin, dedicated to the downfall of Britain by subversion of the military, the Cabinet, the Civil Service and the City; and working not only through spiritualists, whores and homosexuals." Michael Kettle, the author of Salome's Last Veil : The Libel Case of the Century (1977) has pointed out: "Even Buckingham Palace was now seriously alarmed. The Royal advisers were acutely aware that the Royal Family could hardly be described as, well, entirely British. In fact, the Saxe-Coburgs were pure German, unashamedly came from Hanover, and had much more in common with the Hohenzollerns, the German Royal House, than with any decent old British family. The Prince Consort, it was still remembered (the old Queen's first cousin as well as her husband), had spoken a very funny sort of English indeed; and old King Edward had quite an accent, which could become very funny at times too. The present King was all right and spoke well enough. But it was not until mid-1917 that he had renounced his foreign orders and titles - in fact many of them were German - and had hastily changed the family name." 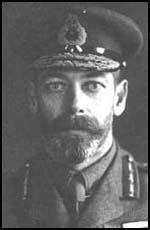 On 25th April, 1917, The Times printed a short piece, headed: "The House of Windsor", reporting that King George V, while addressing the Mayor and Corporation of Windsor, "said his family had long been associated with Windsor, and he had decided, considering the close connection which the Royal House had had for many centuries with the Royal Borough, to adopt the name of Windsor as their family name". In 1917 George V took the controversial decision to deny political asylum to the Tsar Nicholas II and his family after the Bolshevik Revolution. 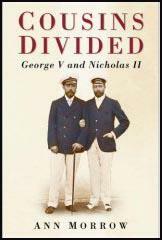 People where shocked by George's unwillingness to protect his cousin but his advisers argued that it was important for the king to distance himself from the autocratic Russian royal family. Some people questioned this decision when it became known that the Bolsheviks had executed Tsar Nicholas, his wife and their five children. The king had not enjoyed good health for a long time and during his final years he spent much of his time on his grand passion, philately. Patriotically, he concentrated on collected stamps from the British Empire. George V died of influenza on 20th January, 1936. His eldest son, Edward now became king. (1) King George V visited the scene of the Somme Offensive on 14th August, 1916. At the end of his visit he released the following statement. It has been a great pleasure and satisfaction to me to be with my Armies during the past week. I have been able to judge for myself of their splendid condition for war and of the spirit of cheerful confidence which animates all ranks, united in loyal cooperation to their Chiefs and to one another. Since my last visit to the front there has been almost uninterrupted fighting on parts of our line. The offensive recently begun has since been resolutely maintained by day and by night. I have had opportunities of visiting some of the scenes of the later desperate struggles, and of appreciating, to a slight extent, the demands made upon your courage and physical endurance in order to assail and capture positions prepared during the past two years and stoutly defended to the last. I have realized not only the splendid work which has been done in immediate touch with the enemy - in the air, under ground, as well as on the ground - but also the vast organizations behind the fighting line, honourable alike to the genius of the initiators and to the heart and hand of the workers. Everywhere there is proof that all, men and women, are playing their part, and I rejoice to think their noble efforts are being heartily seconded by all classes at home. The happy relations maintained by my Armies and those of our French Allies were equally noticeable between my troops and the inhabitants of the districts in which they are quartered, and from whom they have received a cordial welcome ever since their first arrival in France. Do not think that I and your fellow-countrymen forget the heavy sacrifices which the Armies have made and the bravery and endurance they have displayed during the past two years of bitter conflict. These sacrifices have not been in vain; the arms of the Allies will never be laid down until our cause has triumphed. I return home more than ever proud of you. Even Buckingham Palace was now seriously alarmed. The Royal advisers were acutely aware that the Royal Family could hardly be described as, well, entirely British. In fact, the Saxe-Coburgs were pure German, unashamedly came from Hanover, and had much more in common with the Hohenzollerns, the German Royal House, than with any decent old British family. The Prince Consort, it was still remembered (the old Queen's first cousin as well as her husband), had spoken a very funny sort of English indeed; and old King Edward had quite an accent, which could become very funny at times too. The present King was all right and spoke well enough. But it was not until mid-1917 that he had renounced his foreign orders and titles - in fact many of them were German - and had hastily changed the family name. The press coverage for that had been very carefully managed, not too little and not too much. But Lord Stamfordham (the King's secretary) knew well what someone like Noel Pemberton Billing could rake up in the present state of war hysteria over aliens; the name Wettin was not only obviously German, but had a nasty Jewish tinge to it as well. He shuddered at what Billing might do in the Vigilante ("Our Royal Aliens" or perhaps even "The Ashkenazim at the Palace"). It was decided that the King must take the initiative. He must naturalise himself again at once. In the first place the Prime Minister, who it must be remembered was also leader of the Labour Party, had gone to the Palace with the cabinet's mandate for all of us, including himself, to resign office. Secondly, he had not consulted his colleagues about the proposal which the King had made to him, with the support of Baldwin for the Conservatives and Sir Herbert Samuel for the Liberals. In this context his colleagues to be consulted were not only members of the cabinet, but members of the Parliamentary Labour Party and indeed the National Executive of the Labour Party and, in my view, the General Council of the Trades Union Congress. Thirdly, his decision meant that the Labour Party would be in opposition and, therefore, find itself opposing those former Labour colleagues who entered the new government, as well as the Conservatives and Liberals who were to be part of it. Clearly the Labour Party would be injured in the country as a result of these events, although I think many of my colleagues did not appreciate this at the time but thought that the Party would be in an advantageous position politically if the new government, as was almost certain, was to cut unemployment benefit and make other economies which would prove to be unpopular. On MacDonald's sudden and - to his colleagues - unannounced decision to desert the Labour Party I thought, and still think, that King George V was mistaken in taking the course he did by inviting - or did he urge? - MacDonald to become prime minister in a coalition. The natural constitutional course for him to have taken was to ask Baldwin as the leader of the Conservative Party to form a government with Liberal support, which would almost certainly have been forthcoming. As it was, the action of the King was conducive to a split in the Labour Party even though the numbers that went with MacDonald were very few. At the subsequent general election many Labour supporters were naturally confused when they found Labour leaders like MacDonald, Snowden and Thomas, making speeches in which they advised the electors to vote against the Labour Party. In all this controversy the name of the King became involved. None of us wished to speak up too pointedly on that matter in view of the general desire to keep the Crown out of politics, but the King's action had in a way drawn the monarchy into politics, and pretty dangerous politics at that. The King was sitting up in chair with three pillows propping him up. He had changed greatly; his voice was fairly firm but his body weak. I read the business in its usual form and after a slight pause he answered "Approved" in the same tones as usual... He seemed detached from us all and weary. Then he had to sign the warrant... His right hand was plainly useless and lay out of sight on his leg. Dawson knelt by the table in front of him and helped him to manipulate his left, the fingers of which he kept drumming upon the warrant in front of him. "I cannot concentrate" he said with a sighing smile. Dawson suggested he should help him by supporting the pen which seemed to be difficult for him to do.... Watching the struggle he went through to write his clearly expressed desire affection moved me to tears. Then we began to walk out of the bedroom. At first the King took no notice but was told that we were going. He looked at us and smiled. I was the last out and I shall never forget the look illuminated by affection (his eyes looked rather large) which he gave me and continued it as I went and bowed a second time - my final farewell to a gracious and kingly friend and a master whom I have served with all my heart. Even without a world war, those years, I think, must have been years of stress. The advance of science, the spread of education, the progress of ideas of self-government at home and overseas, the pressure of economic forces must have called for difficult readjustments. The world war came and accelerated all these developments. It was a forcing-house of change. The old world passed away and a new one was born. Two things, I think, were required of the Sovereign of a great State in those conditions. The first was sympathy with new ideas and readiness to accept change and to adapt himself to altered conditions. The second was to give to society, bewildered by the rapid progress of events, a rallying-point of stability. These things were found in King George in full measure. They are not common. History affords many examples of rulers who failed, of thrones which were overturned because their occupants stubbornly set themselves against the march of events. King George succeeded where others failed because he was a democrat. He was a supreme exponent of the difficult art of constitutional Kingship. He knew and understood his people and the age in which they lived, and progressed with them. Let me note some outstanding examples. The right to vote has been given to practically every man and woman of full age. The franchise now depends on citizenship and not on the ownership of property. The power of the Upper House has been diminished. Such a change elsewhere and at other times has been resisted by monarchs. King George accepted it as a necessary and just consequence of modem conditions. In the same spirit he accepted the achievement of office by a new Party, the members of which were predominantly drawn from the manual workers, an event almost unthinkable a few decades ago. He agreed to a series of acts whereby the Dominions attained equality with the mother country. The Irish Free State was created and India was set on the road to self-government. He relinquished his nominal sovereignty, or rather he allowed his nominal sovereignty to be apparently diminished, but by doing so he established his real sovereignty in the hearts of the peoples of the Empire. It is the glory of our Constitution that, under it, great changes effected elsewhere by violence are brought about peaceably owing to its adaptability. All this requires that this same quality should be displayed by the King and this King George did. Equally important, I think, has been the power of the King to offer a point of stability in a distracted world. The movements of mass hysteria which have been witnessed elsewhere have passed this country by. One reason has been the presence of a King who commanded the respect and affection of his people and who was beyond the spirit of faction. There was no need to elevate some individual party leader into a national hero, because the King was there to express the views of his people. King George throughout the long years of the war took his full part in the national effort. His example inspired his people in the struggle. But he was no glorifier of war. He stood always for peace. He sought as soon as the war ended to do his utmost to heal its wounds and recreate good relations between nations. No less in the difficult post-war years he shared in the work of reconstruction. He was a real social reformer and took the keenest personal interest in the problems of the day. He recognised the claims of social justice and felt equally the tragedy of unemployment. He shared to the full the life of his people. What were the qualities which enabled the late King to succeed where others failed? It seems to me they were his selflessness and devotion to duty, his kindliness and humanity, his practical wisdom and his courage at all times. The ceremonies which we have witnessed during the last few days carry us back to a time when the functions of a King were very different. The duties of Kingship have had to be reinterpreted with the passing years. King George showed an incomparable understanding of what is required of a King in the modern world. It has been a great piece of good fortune, I think, for our generation that, just when scientific invention has enabled, for the first time, so many citizens of the British Commonwealth to hear for themselves the voice of their King, we should have had on the throne a man who so well understood how to speak to his people, a man who set before the nation ideals of peace, justice and service. We have seen the end of a noble life, a life devoted to the welfare of humanity. In the long roll of British Sovereigns none will, I think, take a higher place than King George.